We’ve already noted that Bill Condon and his production designer might have gotten a little carried away when it comes to Disney’s upcoming live-action adaptation of Beauty And The Beast. The film’s aesthetic, one that might make Marie Antionette go, “Wow, that’s maybe a little much,” was evident in the trailers, and it’s even more prominently on display in this series of character posters. 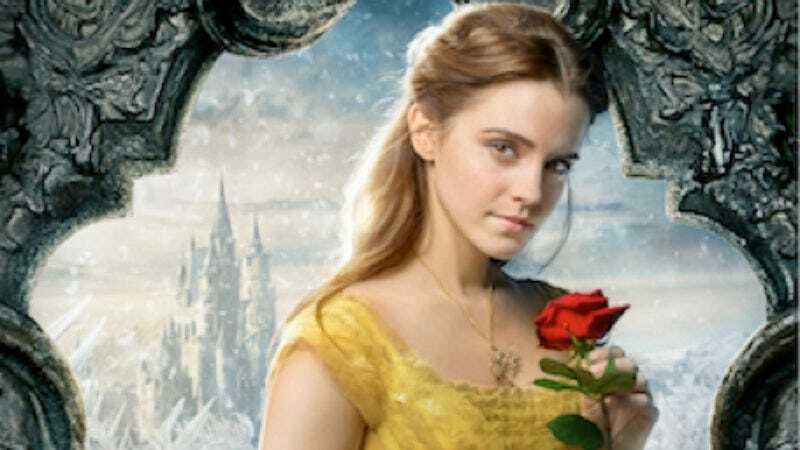 Belle (Emma Watson), Beast (Dan Stevens), Gaston (Luke Evans), and Le Fou (Josh Gad) echo the original animated film, but the actors playing people trapped inside inanimate objects have been rendered largely unrecognizable thanks to some bold wig choices, to put it mildly. See them below, courtesy of Disney. Here’s our Belle, rocking that familiar gold dress. The Beast is more unnerving when his hair looks real. Luke Evans is a handsome man, but his face just became extremely punchable. Who knows what’s up with that wig, but as long as she sings we don’t care. We have no pithy comment. Just look at that devilish Ian McKellen smile. Ewan McGregor, are you in there somewhere? We’re now just imagining how a tea party with Emma Thompson would go down. It’s hard to tell if Gugu Mbatha-Raw’s character is transformed into a feather duster or just a bird. Hoping this is Beast pre-transformation, rather than post-transformation because he looks super snooty.